Holy cow! The Chicago Cubs came back to down the Brewers in extras at Miller Park on Monday night to take sole possession of first place in the NL Central! Jose Quintana tossed a quality start (6 IP, 2 ER, 3 K), and the Cubs bullpen threw five innings of shutout ball to secure the win. It was the kind of win that great teams cobble together. Down 1-0 and 2-1, they tied it in the 8th and slammed the door in the 11th, scoring five. 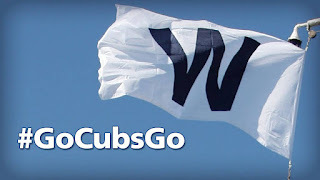 All in all, it was a great team effort: quality start, shutout ball from the bullpen, clutch hitting (5-for-9 with RISP), and 7 runs scored on a night when Bryzzo, Schwarbs, Addy, and Willy combined to go 1-for-20. The series continues Tuesday in Milwaukee.